The “Jedi Gino” tree was created in memory of 10-year-old Gino Altieri, who passed away June 2012 after a two-year battle with rhabdomyosarcoma, a cancer of the soft muscle tissue. Alex, Kristin and Anthony Chmielewski, along with their neighbors, Nurzhan and Adelzhan Pallock-Rottier, and their mothers, decided to decorate a memory tree because the children were friends of Gino, who was a Star Wars fan and even referred to his cancer as General Grievous. 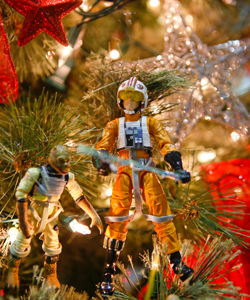 The tree features red and Star Wars-themed motifs. The Star Wars toys on the tree were toys that Nurzhan and Adelzhan used to play with, but donated in order to help keep Gino’s memory alive. The Chmielewski family donates a tree for the Holiday Tree Festival every year because of the wonderful care their son, Alex, received while he was in the NICU at Akron Children’s Hospital when he was born. 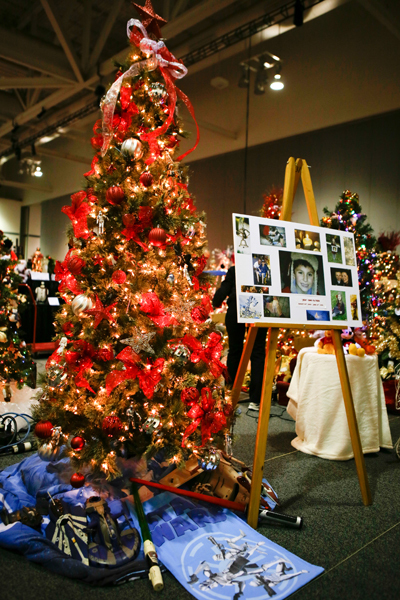 To see these trees and other holiday creations, visit the Holiday Tree Festival Nov. 23- Dec. 1 at the John S. Knight Center. Admission to the festival is free. Share your festival photos and memories via our blog, Facebook or Twitter, using #HTF13.